Stopping in with a quick card I made awhile back using a little DeNami! 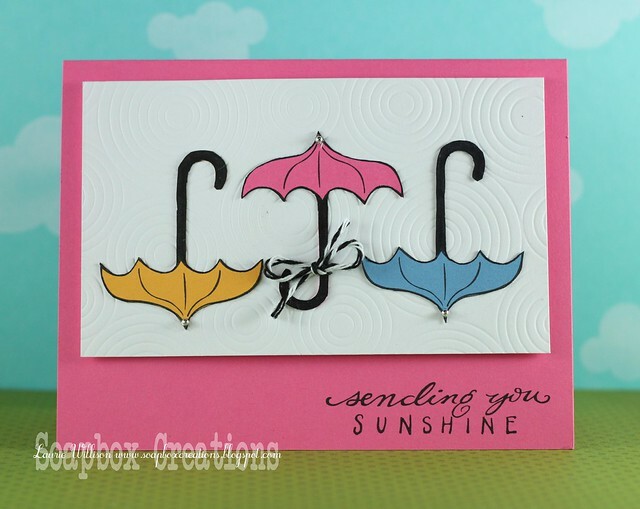 I love this adorable umbrella stamp! Basically, I just cut out 3 umbrellas and then colored in each handle with a black Copic! I attached them to a piece of cardstock impressed with PTI's sunshine plate...love that thing! I took a small piece of twinery twine and tied it to the middle umbrella handle! The sentiment is one of my favorite DeNami senetimens! I just love that font! So this is it for today! My sister and i are going to go to some different scrapbook stores today! Yesterday we went to Scrap It in Fort Collins! That is a really nice store! They even have Twinery Twine there! I have GOT to get ghat impression plate. I always forget when I'm buying. This card is so sweet. I like the colors especially. So pretty! I just love your style! ADORABLE ......... FRESH ....... and UBER FUN!!! The colours really pop with this cute card, love it. Wish I had some good stores nearby to shop :( Have fun, spend lots! AH! you're in Colorado! And hitting all the crafting stores it seems too. Hope your are 'cooling off' inside and finding lots of pretty stuff. Your card is great. You make CAS look wonderful. Oh cuteness! Love the bit of bling on each umbrella! Love how oyu play with this umbrella image!! Just fabulous! That is a cute set and your cutting is perfect! Love those umbrellas placed like this! Very cute! OK, that's it. Now I am ABSOLUTELY getting that impression plate. You make it look so AMAZING! Same for these umbrella stamps! WOW! LOVE this fun card!